Mary Diouf and Mary Faye are two of the thousands of women getting a fresh opportunity to learn through buildOn’s Adult Literacy Program. Like millions of other women in developing countries, both were denied education as children growing up in Senegal and have struggled as a result. On a recent visit to their rural community, they explained how their lives are improving now the buildOn Adult Literacy Classes have begun in their village. Their inspiring stories reflect buildOn’s belief that all people deserve the right to education and it’s never too late to learn. Mary Faye is 60 years old, but never had the opportunity to attend school. She loves helping out with her ten grandchildren, but was sad that she couldn’t help with their homework. Growing up, Mary was always a nervous person and afraid of social situations and speaking in front of others. But now, because of buildOn Adult Literacy Classes, she feels a lot more confident and she’s proud that she can now help her grandkids with their studies. Mary sits at the front of the class, always smiling and always willing to participate. Since learning to read and write, she has become a part of the Senegal Women’s Association, which gives micro-financing opportunities to women in her village. Mary can now participate in this program because she has learned to do basic calculations and determine interest through buildOn’s Adult Literacy Classes. She says she loves that now her classmates have become both business partners and friends. 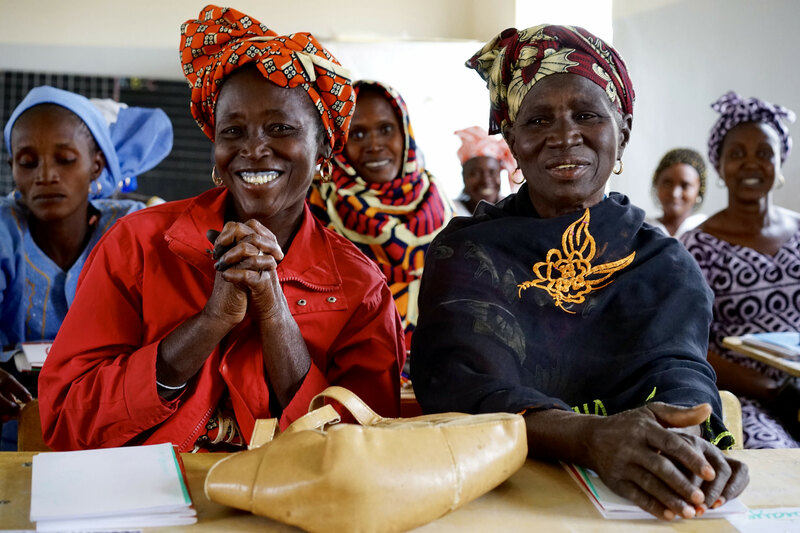 Pictured: Mary Faye (left) and Mary Diouf (right) are two of the more than 17,000 students (78% of whom are women) who have gotten a fresh opportunity to learn through buildOn Adult Literacy Programs. Photos by Caryn Bladt. Mary Diouf is 70 years old and has 10 children and 5 grandchildren. As a child her parents were against educating her because she was a girl. Mary expresses regret about never having the opportunity to go to school as a child, and laments that if she could do it over she would fight harder to attend school. Now she is proud to say that she can read and write, and especially take part in the mobile technology boom that is benefiting much of Africa, receiving and responding to simple text messages on her mobile phone. This new found independence and privacy means a lot to her since previously, if someone sent her a text or wired her money, she would have to turn to an outsider to read the message. Beyond her newly acquired skills, Mary has also found much needed friendship and community within her buildOn Adult Literacy Class. During the rainy season, she used to spend many hours alone in the home doing chores or waiting for the rains to pass, often feeling isolated and lonely. Now that she is part of the Adult Literacy Class, she is part of something important in her community and has meaningful activities to fill her free time. Adult Literacy Classes are just one of the ways that buildOn is empowering women leaders across the globe. To learn more about buildOn’s commitment to gender equity in the classroom, on the worksite, and in our organization’s leadership visit buildOn.org/stronger-together. Special thanks for buildOn Chapter Manager Caryn Bladt for gathering photos and stories from Senegal.